Philip Solomon. Photo by Doug McKenzie kindly provided by Robbie Dale. Philip Solomon was born in Northern Ireland in 1926 into a music-biz family. His father Morris Solomon was a partner in the well-established firm of Solomon and Peres, a music and entertainment retailer, distributor and production house based in Belfast and Dublin. Both Philip and his brother Mervyn went in to the family business. Philip worked as a salesman and depot manager before moving into concert promotion. After spotting Ruby Murray low down the bill of a concert he was putting on, he began promoting the singer with great success. He moved to England in 1961 and, on a tour that he organised for Nina and Frederick, he spotted another act he thought showed potential. The Harmonichords were renamed The Bachelors and, under Phil's guidance, went on to have a string of big hits. 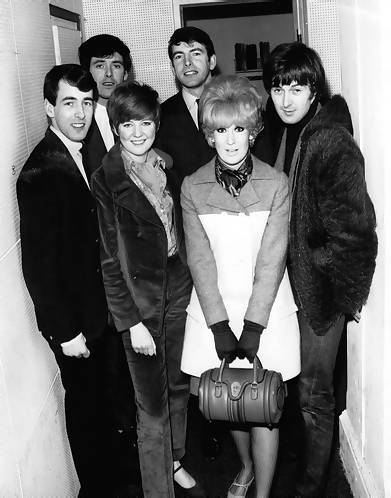 The Bachelors, Cilla Black, Dusty Springfield and Spencer Davis at Caroline House. Photo by Doug McKenzie kindly provided by Robbie Dale. 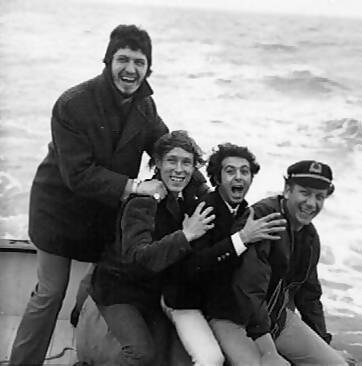 It is not known when Phil's involvement with Radio Caroline began but the station supported his acts, including The Bachelors, Them and Twinkle, from its very earliest days on air. In fact the success of Twinkle's one big hit, Terry, a Top 10 record in 1964, was very largely down to airplay from Radio Caroline as the BBC famously declined to include the song in its programmes due to the morbid subject matter - the death of the eponymous hero in a motorcycle crash. In late 1965 Project Atlanta, which owned Radio Caroline South, went bust and Ronan O'Rahilly, the owner of Caroline North, bought the southern station too. Then, in January 1966, the south ship lost her anchor in a storm and was washed up on Frinton beach. The ship, the mv Mi Amigo, had to be taken to Holland for extensive repairs. At the same time, a more powerful transmitter was installed, studios were renovated, aerial mast extended and a new generator fitted. All very expensive. Following the purchase of the second ship, O'Rahilly's company found itself short of the resources to pay for all this. A new investor was required and Philip Solomon was the man. In February 1966 he put £20,000 into Planet Productions, O'Rahilly's holding company, acquiring 20% of its shares. At the same time he effectively took control of Radio Caroline. Many revere O'Rahilly as the founder of UK offshore radio and an inspirational leader but even his biggest fans don't credit him with the skills needed to run an efficient business. When Phil Solomon arrived, Radio Caroline was not a thriving organisation. Its big audiences had not translated into big bucks. Phil started making changes. South ship senior DJ Tom Lodge has recounted a meeting with Solomon at which he was told that his salary was being halved. Tom chose to leave instead. Many other left too and the staff levels at Caroline House were significantly reduced as Philip Solomon tried to turn Radio Caroline into a profitable business. 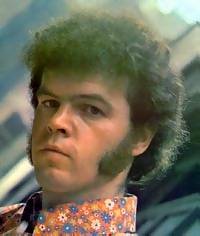 David McWilliams, one of the signings to Philip Solomon's label. Photo © Major Minor Records. Listeners to Radio Caroline in 1967 and 1968 could not miss the preponderance of tracks played from the Major Minor label. This record company was owned by Philip Solomon. Its first few singles did not trouble the pop charts but the sixth release, Seven Drunken Nights by The Dubliners, reached the UK Top 10. This success showed the power of Radio Caroline, although admittedly few of the label's other releases did as well. Even the fondly-remembered Days Of Pearly Spencer by David McWilliams failed to chart. Records on the Emerald label, owned by Philip's brother Mervyn Solomon, were also heavily featured. With the passing of the Marine Offences Act in August 1967, Caroline House was closed. An office was opened in Amsterdam but, as before, it was Phil Solomon in London who was in charge. As an Irish citizen, his involvement in offshore radio was not forbidden by the new law. He operated from his record company offices with his assistant Joan Thirkettle, later to find success as an ITN journalist. The number of plays of Major Minor releases now soared to the annoyance of disc-jockeys and listeners alike but, as these paid plays were keeping the station afloat, it seemed a price worth paying. As recounted elsewhere, Radio Caroline continued broadcasting from its two ships into 1968 but a substantial debt built up with Wijsmuller, the company which was responsible for crewing and servicing them. On the morning of 3rd March the ships were towed away and impounded. In a rare interview about his involvement with Radio Caroline, Philip Solomon spoke to BBC Essex's Ray Clark in 2007 for a documentary called All At Sea - August 14th, What Happened Next?. In it Solomon denied any knowledge of what had led to the towing away of the two ships. Opinions are fiercely divided about Philip Solomon. Some people blame him for not paying the Wijsmuller bills and, as a result, being responsible for the station's closure. Others praise him for keeping Caroline going for so long after the Act, when Major Minor was the only reliable source of income. Maybe both are correct. 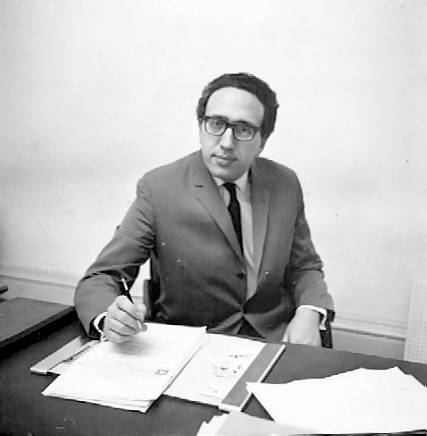 Con Cluskey of The Bachelors, who first alerted The Pirate Radio Hall of Fame to the news of Solomon's death, described him as the man “who helped to rescue Radio Caroline”. Certainly two of the station's top disc-jockeys did not blame him for its demise: Robbie Dale and Spangles Muldoon both went on to work with Phil Solomon again when they started Sunshine Radio in Dublin in 1980. Whatever your opinion of the man, few can deny that he made a substantial mark on the story of British offshore radio. Robbie Dale, far right, with Dave Lee Travis, far left, and two members of Los Bravos. Photo courtesy of Robbie. “Sad news about my old friend Phil. He and I drifted as the years rolled by but I thought of him quite a lot in recent times. Phil was a true and tenacious business cookie, one of my never to be forgotten friends in life. A remarkable stand alone record industry man. Sometimes feared but admired by many. A lot of folks in radio never knew or understood the extent and depth of genuine support Philip R Solomon gave to Radio Caroline at a time when many so called big shots turned their backs and walked away. He and I fell in and out a lot in those turbulent times but I always admired and respected his judgment. I was one of those glad to receive his help and witness his generosity during his outstanding career in the entertainment business and radio game. We must not forget Phil also had an eye for a good filly. I can imagine seeing Phil looking through his time on earth and thinking about his love of music, grace and a turn of speed. God will no doubt keep him busy but well rested.